Algoriddim has launched a sequel to their popular djay iOS app. 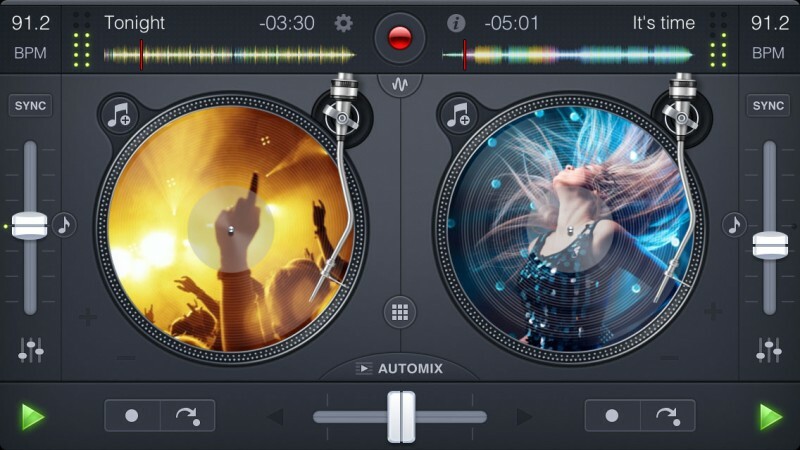 Djay was originally a Mac application, but has since found wide popularity on the iPhone and iPad. The iOS version has won a 2011 Apple Design Award and has seen millions of downloads. The new version offers a revamped user interface, drum machine, sampler, and improved scratching/syncing tools and more. Most notable are features related to offering users direct visual feedback of music. Songs are now actually mapped to "virtual grooves" which reflect the peaks and valleys just like on traditional vinyl. The music waveform is now colored, mapping specific colors to similar sounds, allowing you to visually identify song sections and instruments. It would be nice if there was some form of upgrade pricing and installation. It is an upgrade price - it's discounted by 50%. It's $4.99 and $0.99. That's a really good price for a new version of a very good app. High quality software is the cheapest it has EVER been and people still complain! For most people here the cost of this app is probably 10 minutes pay in your jobs! Even less for the iphone version. I dont mind when people say an update is crap, or its a waste of time. I get that, 5 minutes of my day is valuable. But to complain over 99 cents or 5 dollars for something that took months of time and skill to develop is just really sad. If your employers took the same view of your work that you do with these apps I'm sure you'd be happy getting no more money a week because you did a similar job on a file last week! Do they really think that people will pay for every update? I won't. That's not how AppStore works. They haven't had to pay for every update - there have been plenty of free updates to version 1, but this is a new version and devs have to eat too. So they can't make updates free forever. It's a pittance to upgrade to these new versions. The reason the app store has such high quality apps is because devs get paid for their continued work and commitment to the platform. They have bills to pay and food to put on the table too, you know. It never ceases to amaze me that we live in an age where paying a few dollars for software upsets so many people. This is getting just as annoying as people saying 'Safari seems snappier'. There are way too many kids on this forum, I need to avoid the comments more. 'Free upgrades forever' is not a sustainable business model for devs. Or Apple for that matter. Original a great app with a fatal flaw-cant mix out in stereo. Your mixes record mono-sound crap. This just seems like eye candy. Shame they can't work out a stereo output solution. I guess it's down to hardware limitation. How is this front page news? Please don't tell me this is a slow-news day.